India is more than capable of helping shape the future of connectivity in Asia. India is particularly concerned about the China-Pakistan Economic Corridor project (CPEC), part of the overland “Silk Road” piece of OBOR. But Delhi need not despair as India is already an important part of the existing multi-polar Asia architecture. The logistics scenario in Asia is not as bleak from the Indian perspective as it might appear at first sight. While OBOR captured global imagination when it was first announced over three years ago, it is important to recall that India is itself at the center of major regional connectivity projects. These might lack the dramatic impact of OBOR, but taken together, they bring together a number of solid partners and have the capacity to transform the regional economic and geopolitical landscape to India’s advantage. India, thus, has little need to feel insecure about OBOR. 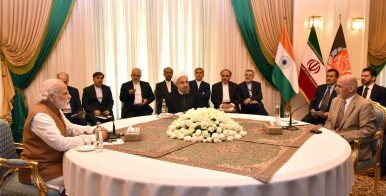 This project has the greatest economic and strategic value for India since it provides unimpeded access to Afghanistan and enables India and Iran to contribute together to the economic development and political stability of Afghanistan. But the importance of this project goes well beyond Afghanistan: it provides a highway across the relatively peaceful northern part of Afghanistan to all the Central Asian republics, culminating at Almaty in Kazakhstan. The other connectivity project with which India is associated is the International North-South Transit Corridor (INSTC). Initiated in September 2000, over a decade before OBOR, INSTC initially brought together India, Iran, and Russia in an effort to create multi-modal links (ship-rail-road) from India to Europe, via the Gulf, Central Asia, and Russia. The partnership was later expanded to include Turkey and the other Central Asian republics. A dry-run to check its viability was also successfully conducted in August 2014, after which transit and customs agreements were approved in September 2015. These connectivity projects received a boost recently when the Indian cabinet approved India’s accession to the Ashgabat Agreement. This multi-modal transport agreement, which brings together India, Oman, Iran, and the Central Asian republics, was initiated in April 2011, two years before OBOR was announced. Its route will be linked closely to INSTC projects. Closer to home, India is looking at a number of connectivity proposals. These include the development of the Andaman and Nicobar Islands in the Bay of Bengal into a maritime hub, including a dry dock and a ship-building facility. At the Sri Lankan port of Trincomalee, India has been looking at setting up a petroleum hub, besides activating the 80-year-old oil tank farm in the strategically-located port city. India has also announced that it will develop a number of connectivity projects in South Asia, valued at $5 billion. Though promoted by China, OBOR is open to a change in course and content. Indian engagement, therefore, is also an opportunity to shape OBOR to suit Indian needs and interests. Given that the CPEC appears to be floundering, Indian willingness to participate and thereby create greater economic viability would also generate great goodwill within important sections of the Chinese state. This goodwill could well influence politics elsewhere, including on Indian membership in the Nuclear Suppliers Group and a willingness to increase pressure on Pakistani state actors on terrorism both in private and in public. Participation in CPEC specifically, and OBOR more generally, in Central Asia and Southeast Asia also allows India to play the role of a “swing factor.” Indian buy-in into the Pakistani economy through CPEC, for example, is also an opportunity to influence Pakistani politics and state actors. Will the Pakistanis or the Chinese agree to allow India to join? There will be groups in both countries that will see business sense in involving India and might well push for Delhi’s inclusion. One OBOR-related project that already involves India directly is the Bangladesh-China-India-Myanmar Economic Corridor, or BCIM-EC. It will involve a combination of infrastructure and trade facilitation arrangements between the four countries, as road, air, and water links from Kolkata in India to Kunming in south-central China, at a total cost of $22 billion. Conceived in the 1990s, BCIM-EC was formally endorsed by all four countries in December 2013 and is viewed as a part of the OBOR connectivity projects. While India will benefit in terms of the development of the Kolkata port and the opening up of the economic potential of its northeastern states, China will obtain one more route bypassing the Malacca Strait. China clearly does not have a monopoly on envisaging major connectivity projects in Asia, and India is fully capable of leading a number of important projects for its economic and geopolitical benefit. Besides the fact that India is a major role-player in a number of strategically important connectivity projects in its neighborhood, there have been a number of developments relating to OBOR that constitute a reality check on Chinese ambitions and encourage a more cooperative mind-set on its part. First, there is little doubt that China has recognized the need for more extensive and intensive dialogue with principal role-players such as India, whose participation in the OBOR would be crucial for the success of the project. Both countries accept the importance of expanding connectivity in Asia, a continent that is rich in resources but unable to move these goods to markets where they are required. If connectivity projects were to be negotiated among the various stakeholders and decisions taken with a cooperative spirit, the strategic value of the projects would increasingly give way to their more important economic value, which would be the true “win-win” that Chinese policymakers have been emphasizing lately. This would open the space for an active Indian role in projects that serve its interests, such as BCIM-EC and those that would promote links from South Asia to Central Asia and Russia. Saadat Hassan Bilal is a PhD Scholar at the School of Politics & International Relations, Quaid-i-Azam University, Islamabad. Linking Kabul to both the China-Pakistan Energy Corridor and OBOR could go a long way in bringing the region together.